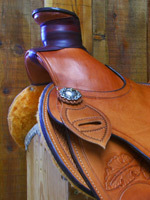 The western saddle has an interesting history and development. The western saddle has an interesting history and development. While it is now considered a uniquely American style, its origins can actually be traced back to the Moorish horsemen and warriors of the Dark Ages. When the Moors invaded Spain in the 700’s, they brought with them their own unique style of riding and tack. Their saddles were designed for battle, with high cantles and forks for protection and security, and longer stirrups to accommodate riding with armor. This was the saddle of knights and the crusades. The Spaniards adapted this saddle into what became known as the Spanish War Saddle. This was the saddle they brought with them to the New World. As their goals transitioned from military conquest to colonial expansion, this military saddle evolved into a stock saddle, designed as a tool for the working cowboy. As the western stock saddle spread into North America, two major branches developed – the Texicans and the Californios. The Texican style was popular east of the Rockies and spread up into Canada. Their saddles were big, plain, heavy square-skirted, double-rigged saddles that were suited for the heavy brush of the area and the “hard-and-fast” roping style. The Californios dominated on the Pacific coast and spread into the Great Basin country and the Northwest. Their saddles were lighter, round-skirted, and center fire rigged for the dally style of roping they used. The milder climate and terrain of the area provided more free time for the vaqueros. They used their time to create highly decorative saddles and established the tradition of saddle carving. Though both of these styles evolved over time and even incorporated some features of the other, you can still recognize these two distinct styles today in the Buckaroo slick fork saddle (Californios) and the swell fork, square skirt saddle (Texican). From the 1700’s through the 1950’s, the western stock saddle continued to evolve, with new features to support cattle work and improved construction methods to extend strength, durability, and comfort. Today, the needs of the working cowboy are no longer the only focus of western saddle design. Today, the needs of the working cowboy are no longer the only focus of western saddle design. Saddles are now designed for a wide variety of uses and riders – rodeo contestant, trail/pleasure, endurance, team roper, barrel racer, reiner, cutter, action shooter, and the working cowboy. Moorish/Spanish War Saddle– Saddle of the knights and the crusades. Brought to the New World. High cantle to prevent the knight from being pushed backwards out of the saddle and high fork to protect from blows. Breast strap & crupper or breeching. -Stirrup leathers hung directly behind the fork. -Ride with long stirrups and straight legs when wearing armor, which allowed them to brace themselves against the pommel to fight. Relatively low cantle and lower fork. Single style rigging, moved from full to center fire position over time. Triangular piece of leather tack to the top of the bars to provide a seat. No skirts, jockeys or fenders. Stirrups cut from one solid piece of wood. 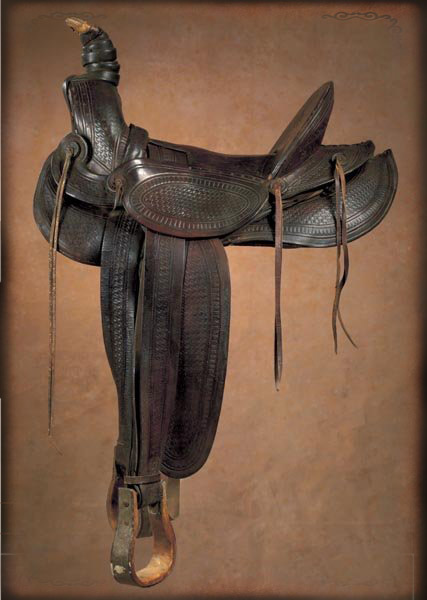 Early 1800’s – Saddle used from Santa Fe to California was a variation of the Vaquero Saddle. With the opening of the Santa Fe Trail, traders brought this saddle east. Became known as the Santa Fe Saddle. Mochila, a leather tree covering with slits to allow the fork and the cantle to protrude. Extended down to protect the rider’s leg from the horse’s sweat. Was removable and often had large pockets. The vaqueros of California design highly decorative saddles with elaborate tooling, lacing, and silver work. Single rigging in ¾ position, draped over the tree. Tapaderos appear in the 1830’s. 1850’s Branded saddles and gear first appear. Visalia Stock Company. Hamley Company. Herman H. Heiser. The mochila morphed into the Mother Hubbard saddle, where the mochila is a permanent part of the saddle. By 1866, most Texas cowboys rode Mother Hubbard saddles. After Civil War, full double rigging starts appearing on Texas saddles. Hard-tying cattle to the horn causes the back of the saddle to tip up. Flank cinch added to stabilize the saddle. Skirts and housings (jockeys) appear. In Texas square skirts are popular. Over time, round skirts become the norm in California. Hence the names Texas Skirts and California Skirts describe the skirt shape. 1870’s Fenders appear. They hadn’t been necessary with the Mother Hubbard style. Mother Hubbard’s now not the popular style. 1874 Cheyenne roll introduced in Frank Meana’s shop in Cheyenne, Wyoming. Purely a decorative feature. 1885 Steel horns appear. Wood horns would often break from the strain of tying off cattle. Steel replacements started to be used for repairs and then became the norm in new saddle construction. 1880’s Loop seats appear. Square cut outs of the seat reveal tops of the stirrup leathers where they hang over the tree. Allowed for easy cleaning, oiling, and replacement. Popular through 1920. 1880’s Padded seats appear (although not on the rig of any self-respecting working cowboy). 1890’s Saddle swells appear. Originally created by adding a type of bucking roll around the fork. Later evolved into swells that were incorporated into the fork. Purpose is to prevent the rider’s pelvis from slamming against the fork on a bucking horse. 1910 Deeply undercut swell appears. Was supposed to create security, but could be difficult to get out of and very dangerous. 1919 Association Saddle created. This was a standardization of the saddle used in rodeo contests. 1920 Front and side (seat) jockeys now created from one piece of leather. 1930’s The excessive slanting of the seat up the fork starts. Prior to this time, the seat had been relatively flat, a balanced seat. The upward slanting seat tends to force your weight and balance back and your feet forward. Not a great riding position. 1922 First flat plate on tree rigging appears. Development of extensive variety of specialized saddle types – endurance, barrel racing, reiner, cutting, training, team roper, etc. Introduction of synthetic materials in the construction of saddles. 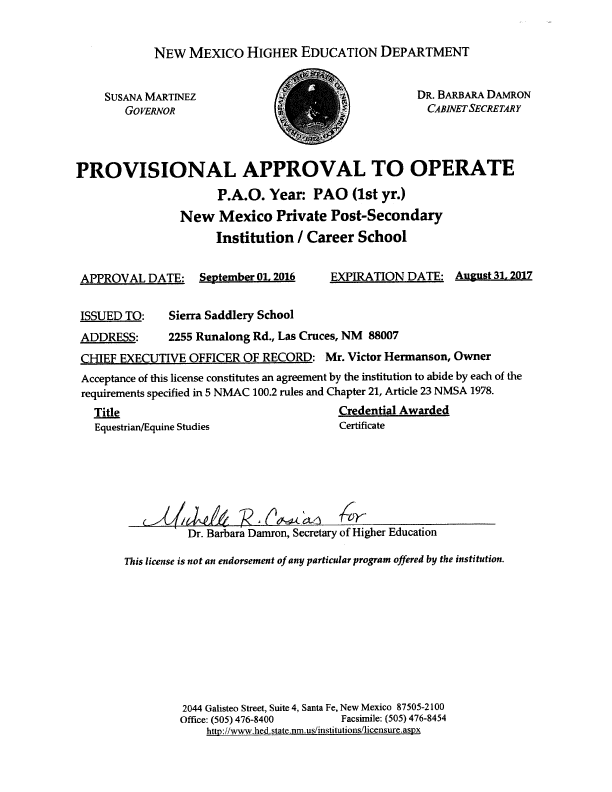 1977, Sierra Saddlery School is established.